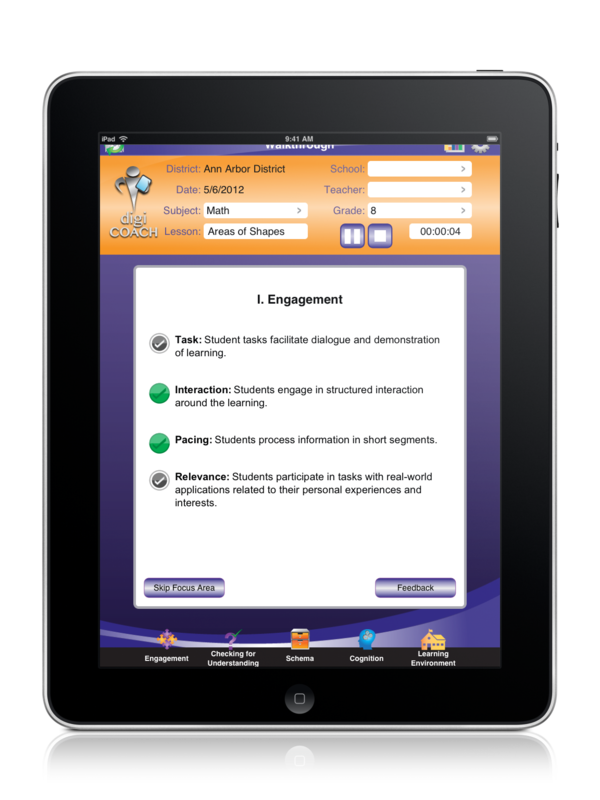 FOR IMMEDIATE RELEASE—August 7, 2012—ANN ARBOR, MI—Logic Solutions and Digital Edge Learning announced the release of digiCOACH, an iPad-based formative coaching system for K-12 school administrators and instructional leaders. digiCOACH combines modern mobile technology with proven educational research to drive effective professional development decisions and provide teachers with instant feedback. Administrators use digiCOACH while conducting classroom walkthroughs to record observed criteria based on five focus areas highly correlated with increasing student achievement: Engagement, Checking for Understanding, Schema, Cognition, and Learning Environment. The app displays a list of predetermined criteria for each focus area, and the user may skip sections that are not relevant to the walkthrough by swiping past the screen. By tapping on any item in the list, an administrator “checkmarks” that he has viewed the standard in practice. The user-friendly interface significantly improves the walkthrough process, making it quicker and more highly focused. digiCOACH functions in classrooms without an internet connection; information is stored locally on the device until a user synchronizes with a secure cloud database. As a user records observed criteria, he or she can provide immediate email feedback to a teacher—eliminating traditional paperwork and processing time. The user can choose from a bank of positive strategies and coaching tips, but may also write custom messages (a Wi-Fi connection or data plan is necessary to transmit email). digiCOACH cloud management tools collect data synchronized from the apps to create reports that can be used to drive professional development decisions. An administrator can access and filter reports based on focus area, grade, subject, teacher, and time of walkthrough. He/she can also create grade and lesson subject comparison reports. Logic’s programmers developed the digiCOACH mobile app on the Appcelerator Titanium platform. The app stores data locally in a SQLite database, and synchronizes with a MySQL back end database. Logic’s programmers designed the digiCOACH web portal using the Drupal Content Management System. Because Digital Edge Learning required a high degree of visualization with reporting tools, Logic programmed a significant amount of custom reports that meet the needs of administrators and professional coaches. digiCOACH is not an instrument for teacher evaluation, rather the walkthrough criteria deal solely with instructional strategies and student engagement. Focus areas correspond with many school and district Professional Learning Community initiatives. We are dedicated to providing the best Digital Delivery℠ instruction for educators and their specific needs. We want you to experience the benefits of working with a team that knows what teachers, administrators, and students need to achieve. Our professional development courses give you the tools to connect with all students through research-based instruction, while seamlessly incorporating technology.